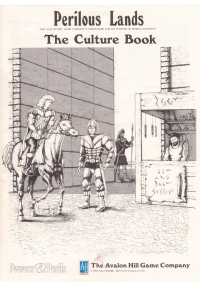 The Culture Book breathes life into Perilous Lands. It details seventy-one cultures who dwell in the Perilous Lands. Each description details the culture's past history, commonly used languages, features of the social environment and other factors that can be used to color your world. It is important to note that the details in this book are only a starting point for each culture. Expand on them as you feel is necessary to do so. While this volume is detailed and exact, it is not the final word on any of its cultures. You must decide which factors will be stresses in your world. Use this book as a guide, not a bible.